In my 15 years as a Sonoma County Family Law Attorney, I have noticed definite trends. A frequently recurring trend appears in the cases where one spouse wants a divorce and the other is surprised by it. In those cases, there is always an emotional element that must be overcome before the couple can mediate, or collaborate towards a successful custody arrangement, and division of assets and debts. The emotional element starts with the decision to separate and ends when both spouses accept that the relationship is over. For a divorce to go smoothly, whether using mediation or collaboration, it is important to be aware of where you and your spouse are in the emotional element. No matter what caused the relationship to fall apart, and no matter who decided to end it, both of you will go through a period of emotional adjustment. For many couples, the end of a relationship is similar to the grieving process involving the death of a loved one: denial and shock; bargaining; anger; sadness or guilt; acceptance. Each spouse goes through this process differently and on a different time-line. If you initiated the separation, you may have gone through the stages long before you decided to divorce, hoping that the relationship doesn’t need to end. Your spouse is often taken by surprise and still hopes to repair the relationship. Be aware that your spouse may need some time to accept the idea of divorce. On the other hand, where both couples are ready for the divorce, or have accepted it, child custody, and the division of assets and debts goes relatively smoothly and quickly. The other stages of grieving the relationship already occurred. 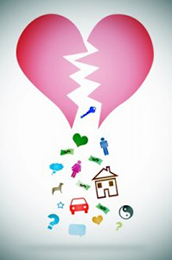 As a result, the cost of the divorce remains relatively low. Consequently, if you and your spouse are in very different phases emotionally, allowing time to pass before attempting to negotiate can be extremely effective with significant cost savings. Often emotional support with a counselor or other resources can help the process. Unlike lawyers in a typical adversarial case, mediators and collaborative attorneys are trained to recognize the emotional element and can, therefore, help counsel and negotiate while still protecting their clients’ interests. With the help of a mediator or Sonoma County collaborative attorney, you can assess the problem, identify the issues, and ultimately make the decisions. contact the Law Offices of James F. DeMartini for knowledgeable, personalized representation.